Amaze the cupcake lover with twelve cupcakes in assorted cake flavors, each hand-dipped into the chocolate topping of your choosing. Each bite provides a rich, decadent bite of chocolate. It's a gift that the recipient will never forget! if ordered by 10:00 am EDT Wednesday April 24th. 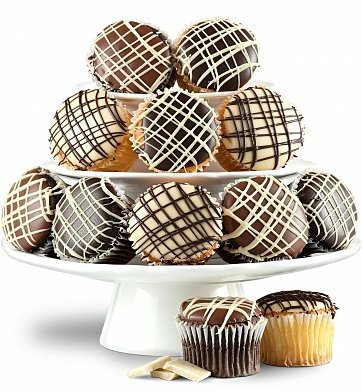 One Dozen Chocolate Dipped Cupcakes is a hand delivered gift. These gifts are delivered by one of our local design centers located throughout the United States and Canada. Same day delivery is available for most gifts when ordered before the cutoff time. The cutoff time for One Dozen Chocolate Dipped Cupcakes is 7 AM in the recipient's time zone. Hand dipped and drizzled with Belgian white, milk or dark chocolate. That was the response I got from my sister that is winning the battle against cancer: "Best cupcakes ever." I am glad I made the right choice by using GiftTree. You brought happiness to someone that has endured a lot of suffering over the last several months. Thank you for being there GiftTree! My order was delivered on time, and I was informed every step of the way, which I really appreciated. Wonderful, like eating the best chocolate fudge cake, with all different chocolate candy-like icing!